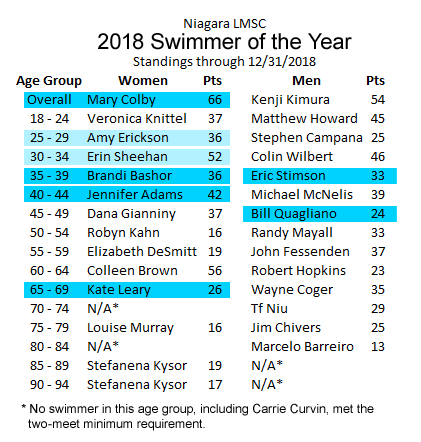 Nickel City Splash is part of the Niagara District of US Masters Swimming. In addition to our Masters swim club, we offer Masters water polo and adult learn-to-swim programs. We provide coached workouts at UB’s Alumni Pool on Tuesday through Saturday. We are sanctioned by United States Masters Swimming (USMS) and are affiliated with the women’s swim team at the University at Buffalo. As a Nickel City Splash member, you must join USMS. Practices are held at UB’s Alumni Pool. Most workouts have a warm-up set, a drill or kick set, and a main set. Coaches provide a workout, sometimes on paper and sometimes on the whiteboard. Which lane should I swim in? Check with a coach and they will make sure you understand where the lanes are located for your particular interval training group. Our interval options vary between 1:10 per 100-yard, free-training base, to 2:00 per 100-yard, free-training base. There is a spot for everyone! Enter Alumni Arena through the back door (on the side of the building which faces the stadium). Support Our Heart-to-Heart Relay Team! The Step Challenge is Back! 2018 Swimmer of the Year Awards! The 2018 Swimmer of the Year Awards will be presented at the NYS Championship Meet in Binghamton during the Saturday (April 6) session. Congrats everyone! All winners receive a plaque and USMS mesh equipment bag. Overall winners this year receive a USMS hoodie as well! If you can’t make the event, please have a teammate pick it up, or come to the RAMS meet on April 28. Nickel City Splash was founded by Mari Neumer and Dana Anello White in the summer of 1995.